You ever spend a ton of time trying to add a fish to your Lifelist, only to later find out a closer, more abundant population existed later? Because same. After school got out, I loaded my car and drove up to visit my brother, Gabe. I knew it would be the last summer he lived in Corvallis with his roommates, the guys who had been surrogate brothers to me in the dozens of times I’d visited them over the years. Sure, I wanted to spend time with my brother, but I also liked the change of pace. Jake called it “Hotel Gabe,” and I guess that was partly true. I did always take time to fish when visiting. In fact, I fished a lot out of that Corvallis apartment in five years’ time. I changed careers, finished a Master’s degree, became a species hunter, and even started writing about fishing while they lived there. It held more memories than any other place I’d never actually lived in. Like always, I wanted to fish. 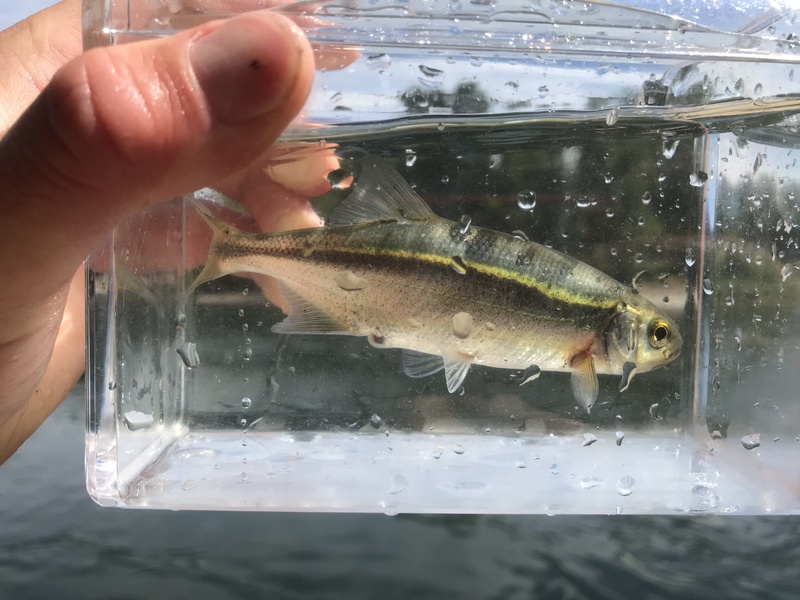 So as I went out to the Willamette River to try for a species that was put on my radar since I started microfishing six months earlier from that very spot, I got emotional. I caught my Redside Shiner, though I had to work for it. Species #126. But I was still sad. This wasn’t like all of the other times I’d fished there. We were celebrating Gabe’s graduation, and his then-girlfriend (now fiance), Rylee Salutregui and her family were there for the festivities, as she was graduating, too. After catching a Redside Shiner just a few minutes from Gabe’s house, I surveyed the place I’d come to love as a second home and said my goodbyes to the place. The people would be a little tougher. The next day, we went fishing as a group. There were no new species, but it was worth sharing nonetheless. Of those original four roommates that Gabe had lived with for so long, all of whom played Oregon State Football, only Adam Soesman and Drew Kell are still in Corvallis. Marcus McMaryion transferred to Fresno State and got snubbed for an NFL Combine Invite, but he’ll probably at least make an NFL roster next year. Trent Moore, one of his roommates and best friends, now lives with Gabe in Beaverton. Gabe will be moving out to get a place with Rylee when they get married this fall, and life moves on. Their core friend group has gone different directions, and I miss those guys. I never had college roommates (I lived with my parents), and these guys were the closest I ever came. I’d visit about once per month for almost five years. It was a way of life for me, and change is tough — even for the brother who only visits on occasion. Read about saying goodbyes even as we said new hellos by clicking here. Read the next entry in #SpeciesQuest here: Species #127 — Rosylip Sculpin.